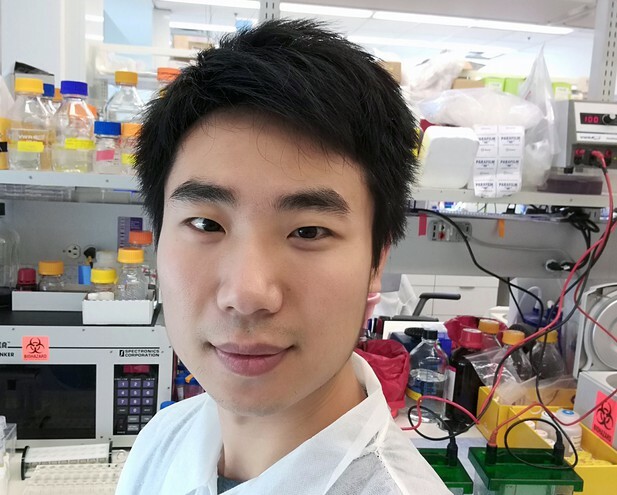 Moving from China to the US to do a postdoc is part of Huan Yan's plan to have his own lab one day. One of the first papers to be published in eLife reported how Huan Yan, then a PhD student in Beijing, and co-workers had identified the receptor that allows the hepatitis B virus to enter human liver cells. Yan continued to work on the virus after his PhD, including a stint on a project funded by the pharmaceutical company Merck Sharp & Dohme. Now, five years later, Yan is a postdoc at the University of Southern California (USC), where he is working on the human papilloma virus. Huan Yan in his lab at the University of Southern California. Back in 2012, did you have a plan for the next five years of your career? I did not have a specific plan, but I knew that I wanted to pursue questions related to the hepatitis B virus, so I decided to spend two or three years on these projects and to make a final plan later. In the first two years, I answered some interesting questions related to the receptor for the hepatitis B virus. For example, how does the receptor interact with the virus? How does the receptor influence the fact that the virus can only invade cells from a very limited range of species? After that, working at the National Institute of Biological Sciences (NIBS) on a project supported by Merck Sharp & Dohme (MSD), I spent the next two years developing HBV entry inhibitors to prevent the virus from entering cells. Why did you get involved in the collaboration between NIBS and MSD? Since I wanted to continue working on the hepatitis B virus and was interested in developing antiviral drugs, it was an opportunity for me to learn how research is done in industry. I thought that working with a pharmaceutical company may also be helpful for my future career. How did you choose the project you are working on at USC? I spent two or three months finding out what the important questions in virology are after I came to USC. I was looking for a new challenge – I wanted (and still want) to answer another difficult question like my previous work on hepatitis B. I decided to study how the human papilloma virus, which is a leading cause of cervical cancer and many other cancers, enters human cells. We know surprisingly little about the entry mechanism for this virus – the viral receptor remains unknown, although several putative candidates have been suggested. My aim is to identify this receptor. To do this I use a combination of techniques from molecular biology, chemical biology and virology. Why did you move from China to the US? There are several reasons why I made this decision. Firstly, I wanted to experience how research is done in the most outstanding labs in the world, many of which are in the US. Secondly, English is so important for scientific researchers, especially to us who are not native English speakers. Lastly, China highly values overseas research experiences for young scientists. For example, the Thousand Talents Plan, the best start-up program for young scientists in China, requires at least three years of overseas research experience. What are the biggest differences about working in China and the US? In terms of research, there is no big difference for me, but reagents tend to be delivered more quickly in the US. Do you think you’ll move countries again in the future? That remains an open question. My first choice is to move back to China after I finish my current postdoc project. The overall research environment in China is getting better and better, but the competition is also becoming more severe. I may consider staying in the US if a good opportunity arises, but other factors may affect my choice, including family and culture differences. What has been the highlight of your research career so far? The paper we published in eLife is the most important work I have done. In addition, it was a great honour for me to win the Ray Wu prize in 2013, which is awarded to outstanding PhD students in China, Hong Kong, Taiwan and Singapore. The winners are determined by peer review by a selection committee consisting of eminent Chinese biologists who assess the candidates’ creativity, independent thinking and dedication to science. Who has supported you the most throughout your research career? I’ve got a lot of help from many people, but my previous mentor Dr Wenhui Li is no doubt the one who supported me the most. In his lab, I grew up from a fresh student to a young scientist with experimental skills and the ability to think independently. He is also the person who encouraged me to take on risky projects and inspired me to find creative strategies to overcome difficulties. Have you had any difficult times in research? Yes, I think so. I had almost no experimental skills when I started my PhD because I had graduated from a medical school with a different training system. It was a tough time for me, and I had to work harder than other students to be able to do experiments independently. I got a lot of help from my colleagues and advisors at this stage. The past few years have also been tough: when I look back the past five years have not done much to help me to become an independent PI. That’s why I am here taking on another big challenge – I now have to prove myself again in a new place with a new project. The most important thing is to become an independent PI. To achieve that, I’m aiming to make great progress and publish my next big paper in two years, and get a good independent position in the following year. If everything goes well, I want to firmly establish my lab in the two years after that, and then I can fully focus on what I am interested in. What do you do in your free time outside of the lab? I spend most of my free time with my wife and my 18 month old baby boy. Being a postdoc is tough, but it is tougher to be a postdoc’s wife. My wife sacrificed a lot to support my career, so I try my best to compensate for that and make my family happy when I am out of the lab. Usually we will go shopping, or take a short walk in the park close to our apartment. These times are the happiest for the whole family. What career advice would you give to PhD students who are in a similar position to the one you were in five years ago? Work hard, move fast, and don’t hesitate to take on challenges. Once you’ve achieved your goal, make a new plan, and execute it immediately. It will be tough, but life will be wonderful if you can contribute even a little bit to the treasure of human knowledge.